Annexins are a family of proteins that bind to phospholipid membranes in the presence of calcium. Annexin V is a valuable tool for studying cell apoptosis. It is used as a probe to detect cells which have expressed phosphatidylserine on the cell surface, a feature found in apoptosis as well as other forms of cell death. There are a variety of parameters that can be used for monitoring cell viability. Annexin V-dye conjugates are widely used to monitor cell apoptosis through measuring the translocation of phosphatidylserine (PS). In apoptosis, PS is transferred to the outer leaflet of the plasma membrane. The appearance of phosphatidylserine on the cell surface is a universal indicator of the initial/intermediate stages of cell apoptosis and can be detected before morphological changes can be observed. This fluorescent Annexin V conjugate has spectral properties similar to Alexa Fluor® 647 (Alexa Fluor® 647 is the trademark of Invitrogen) and Cy5® (Cy5® is the trademark of GE Healthcare). 1.1 Prepare Annexin V-binding assay buffer: 10 mM HEPES, 140 mM NaCl, and 2.5 mM CaCl2, pH 7.4. 1.2 Treat cells with test compounds for a desired period of time (4-6 hours for Jurkat cells treated with staurosporine) to induce apoptosis. 1.3 Centrifuge the cells to get 1-5×105 cells/tube. 1.4 Resuspend cells in 200 μL of Annexin V-binding assay buffer (from Step 1.1). 1.5 Add 2 μL of Annexin V conjugate into the cells. Optional: Add a dead cell stain such as Propidium Iodide into the cells for necrosis cells. 1.6 Incubate at room temperature for 30 to 60 minutes, protected from light. 1.7 Add 300 μL of Annexin V-binding assay buffer (from Step 1.1) to increase volume before analyzing the cells with a flow cytometer or fluorescence microscope (see Step 1.8 below). 1.8 Monitor the fluorescence intensity by using a flow cytometer or a fluorescence microscope (See Step 2 or 3 below). Quantify Annexin V conjugates binding by using a flow cytometer with appropriated filters. 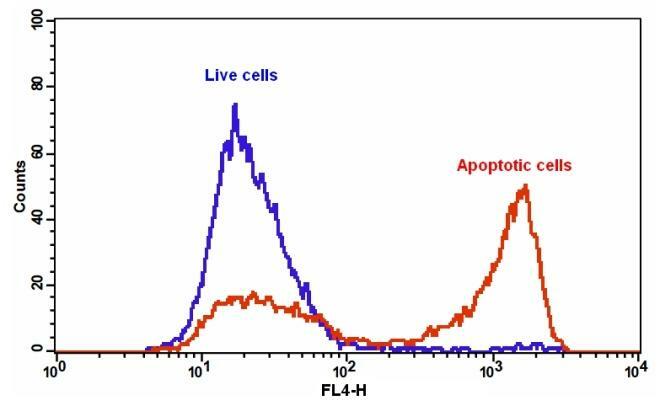 Note: Annexin V binding flow cytometric analysis on adherent cells is not routinely tested since specific membrane damage may occur during cell detachment or harvesting. However, methods for utilizing Annexin V for flow cytometry on adherent cell types have been previously reported by Casiola-Rosen et al. and van Engelend et al (see Refs 1 and 2). 3.1 Pipette the cell suspension from Step 1.6, rinse 1-2 times with Annexin V-binding assay buffer (from Step 1.1), and then resuspend the cells with the Annexin V-binding assay buffer (from Step 1.1). Add the cells on a glass slide that is covered with a glass cover slip. Note: For adherent cells, it is recommended to grow the cells directly on a cover slip. After incubation with Annexin V conjugate (Step 1.6), rinse 1-2 times with Annexin V-binding assay buffer (from Step 1.1), and add Annexin V-binding assay buffer (from Step 1.1) back to the cover slip. Invert cover slip on a glass slide and visualize the cells. The cells can also be fixed in 2% formaldehyde after the incubation with Annexin V conjugate and visualized under a microscope. 3.2 Analyze the apoptotic cells with Annexin V conjugate under a fluorescence microscope with appropriated filters.